Like most people who frequently charge house-sized waves, 24-year-old surfer Torsten Durkan spends ample time out at Jaws and Nazare just for the love of it. The rush, the adrenaline, the feeling of flying down the face of gigantic walls of water–he usually doesn’t ask for much more. But during last year’s El Niño-fueled winter, the Maui local decided he wanted to do some good in conjunction with chasing purple blobs around the world. At the start of the El Nińo season, Durkan started asking people and businesses to pledge money, by the foot, for the biggest wave he was able to nab that winter, so that he could raise funds for coral research at the Hawaii Institute of Marine Biology. He ended the campaign by scratching into a meaty, 50-foot Jaws whopper and making it to the channel stoked and unscathed. Now the philanthropic big-wave charger is running a second campaign, this time asking individuals to contribute money that will go toward reducing plastic usage in Maui. We caught up with Durkan last week, just a few days before a solid NW swell was set to hit Jaws, to find out more about his two campaigns, his connection with Pe'ahi, and why he hopes to get other athletes involved in similar humanitarian projects. So why'd you decide that surfing big waves would be your way of raising money for environmental related issues? I think it started with having a few scary experiences surfing big waves, reflecting upon that, and questioning my motivation for being out there. I think I wanted to make my whole experience in big surf more purposeful, because I felt like it was a selfish endeavor surfing huge waves and risking my life with my friends and family worrying about me. I also wanted to give back to the ocean because it gives me so much joy. So I started thinking, 'How could I integrate something more selfless into my own surfing'? One of my dad's friends was doing a similar fundraiser through cycling, where people were pledging money for every minute he finished a race under a certain amount of time. I took that model and added it to my surfing. From my background in biology, I knew that because it was going to be an El Niño year, there was going to be huge issues with coral bleaching. The warm water associated with El Niño messes with the metabolism of the coral. Whenever people think about El Niño, they usually think about good waves; no one stops to think about the coral reefs beneath them. There were better waves because the ocean was warmer and creating bigger storms, but that same warm water also destroyed coral ecosystems. So I decided to partner with Dr. Ruth Gates at the HIMB, who is actually doing something about the degradation of reefs. She is basically breeding super coral and training them to be more resilient to conditions of the future, because the ocean temperature and acidity are projected to keep getting worse as more fossil fuels are being burned and absorbed into the ocean. So how big was the winning wave? 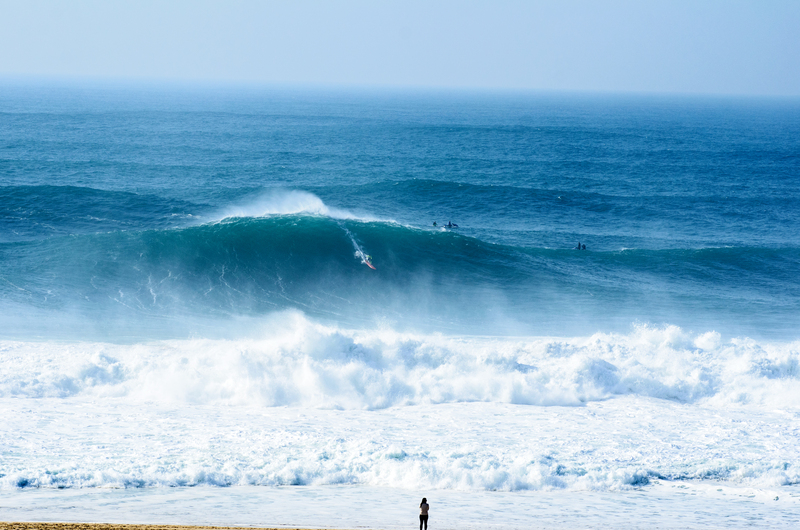 It came down to two waves: one was at Nazaré and another was at Jaws. I put together a small judging panel of professional surfers and kite surfers and they visually extrapolated the wave size through the photos I gave them. They determined that the wave I got at Nazaré was 48 feet, and the one I got at Jaws was around 50 feet. The money I got from that wave went to support a variety of projects within Gates' department. It helped fund graduate students so they could go to conferences, and it also went toward facilities that house the growing coral. This year, you're raising money to buy reusable water bottles for the kids at Haiku Elementary and also to install a filtered water station on the campus. What motivated this second campaign? After my first campaign ended, I partnered up with Rodney Kilborn, who organizes the Pe'ahi Challenge, to put together a cleanup at Jaws. I wanted to give back to the place where I got my biggest wave. We ended up with two huge overflowing dumpsters of trash. After seeing how much plastic was washing up on shore, I wanted to do something to mitigate plastic usage on the islands. So I decided to partner with the Rob Machado Foundation, which equips schools with water stations for reusable water bottles and all the students with canteens. I thought it was a perfect fit because it'll teach kids that they have an impact on the environment by just reducing their water bottle use. In the United States, 50 billion water bottles are used annually and only about 23% of it gets recycled. Plus, plastic can only get recycled once. It just stays in the environment. Why'd you choose Haiku Elementary? For one, it's where I went to school, along with Albee [Layer], Paige [Alms], Ian [Walsh] and all those guys–and it's the closest school to Jaws. I also wanted to focus on my local community, because if I'm not helping out there, who is? I felt like my voice is the strongest in my local community. If we can raise enough money, we can add additional water stations to the campus, and maybe even expand the project to include other schools on Maui. You've run these two campaigns under the platform of Athletes Be Cause, where other surfers and athletes can start their own activist projects. Are you trying to get other surfers involved in projects like yours? Yeah, big-wave surfers are already going out there and charging, so they might as well do it for a good cause. I also think it'll give publicity to the whole sport of big-wave surfing, too. When you're fundraising for something outside of surfing, it brings a different audience. My friend and Portuguese big-wave surfer Alex Botelho is doing a campaign this year under Athletes Be Cause. There are some big oil companies trying to drill offshore and do fracking onshore in the southern reserves of Portugal. So he is pretty much doing the same thing I was doing, but at Nazaré. The money he earns will go to a couple organizations that are organizing social and political campaigns against these oil-drilling companies. Do you feel like being a big-wave surfer, you have more of an appreciation for the ocean, and you feel like you need to protect and maintain it? Yeah. Having numerous life and death experiences at places like Jaws and Nazaré definitely forces you to have an emotional connection to the ocean. But the ocean also allows us to live. We got a lot of our food from the ocean, and something like 60% of our oxygen comes from the ocean. It has always been imperative to care for the ocean, but now more than ever, we are starting to see the ill effects we’ve placed on marine environments. It definitely seems like we are at a tipping point, where if we don’t start changing things now, we'll be stepping into the unknown for reefs, fisheries, and the overall ecological health of the ocean. Editor’s Note: If you’d like to contribute to Durkan’s current campaign, click here.